A modern, light-weight, Eigen-based C++ interface to Nonlinear Programming solvers, such as Ipopt and Snopt. 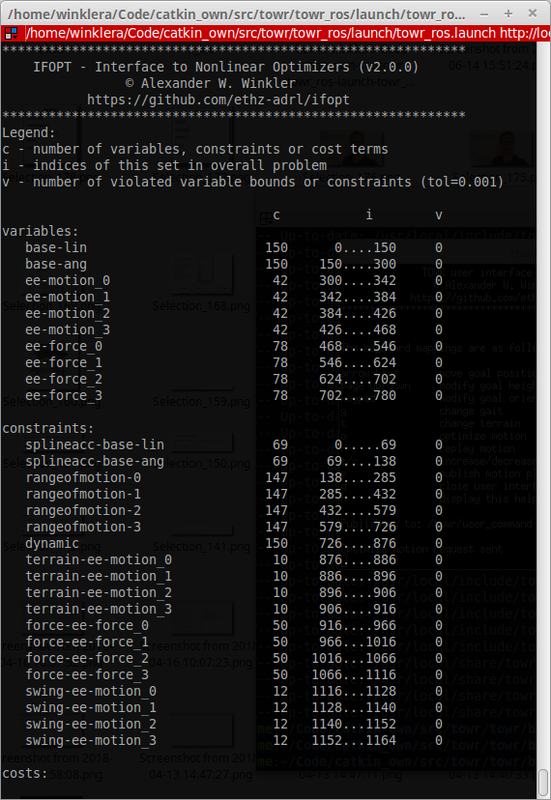 To see how this problem is formulated, see test_vars_constr_cost.h. Afterwards the problem can be solved using e.g. Ipopt as shown in ex_test_ipopt.cc. The easiest way to install is through the ROS binaries and you're all set! If you want to link to a local installation of Ipopt or to Snopt, see here. You should see ifopt_ipopt-example....Passed (or snopt if installed) as well as ifopt_core-test if gtest is installed. For an overview of how to formulate your problem, start here. We love pull request, whether its interfaces to additional solvers, bug fixes, unit tests or updating the documentation. Please have a look at CONTRIBUTING.md for more information. See here the list of contributors who participated in this project. If you are building from source and want to use a locally installed version of Ipopt add the path to your Ipopt build folder to your ~/.bashrc, e.g. If you need an interface to Snopt, point cmake to that build folder in your ~/.bashrc through e.g. set default print level to 4 to show derivative test errors. generalize ipopt solver interface, so source never has to be touched. Fix/simplify image path in doxygen. Install binaries to /lib/ifopt, just as catkin does. Update README.md to always use make test for testing. moved CI to ros buildfarm.